Wow man. In honour of Kardi‘s upcoming release (this Friday! ), Del F. Cowie and Exclaim Magazine pay him some WELL DESERVED respect and outline his whole career in a beautifully laid out years-by-years breakdown. Definitely a must-read! I even learned a couple things. 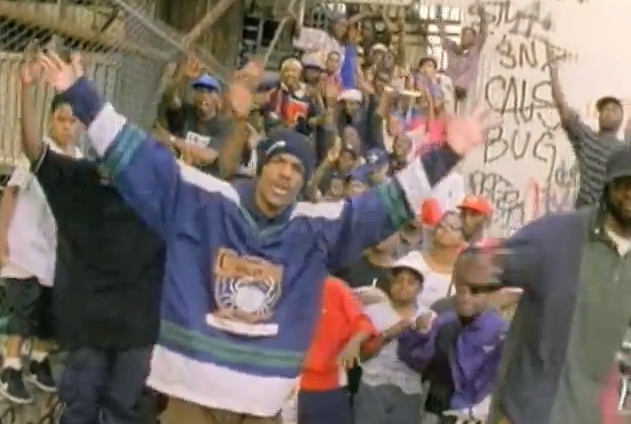 Before it was the 6ix, Toronto was the T-dot. While he didn’t make up the term, no one contributed more to its popularity than Kardinal Offishall. 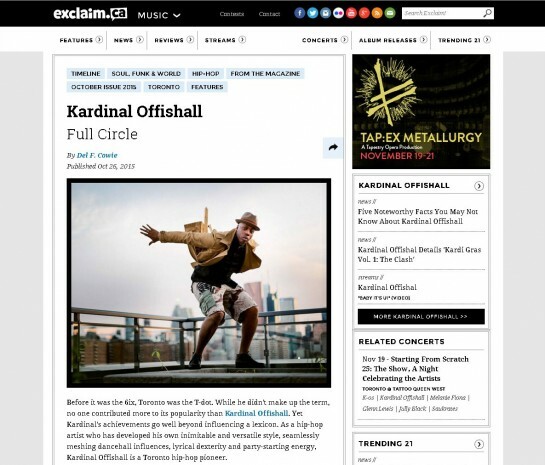 Yet Kardinal’s achievements go well beyond influencing a lexicon. As a hip-hop artist who has developed his own inimitable and versatile style, seamlessly meshing dancehall influences, lyrical dexterity and party-starting energy, Kardinal Offishall is a Toronto hip-hop pioneer. By forging a career as a well-respected MC when Toronto’s hip-hop scene wasn’t in the spotlight, his determination broke down barriers. 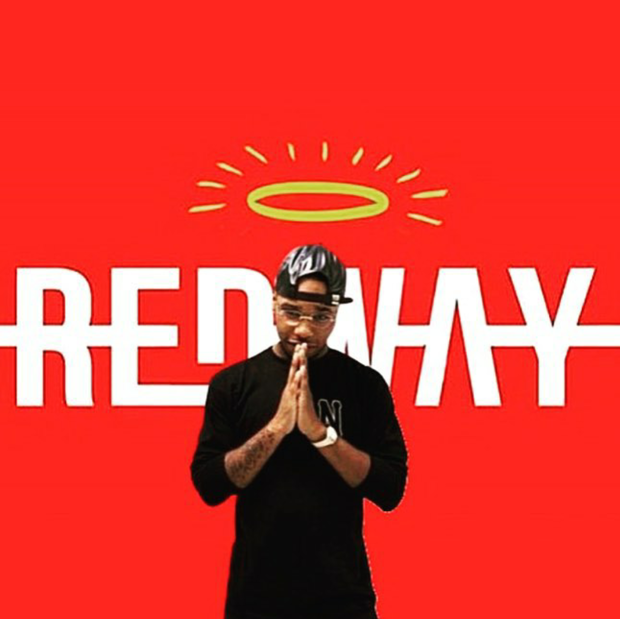 Having established himself with a relentless work ethic, whether applied to his recording output or his undeniably entertaining live shows, Kardinal has gained the respect of some of the world’s most influential artists and producers. As he readies his latest album Kardi Gras: The Clash for late October, balancing the responsibilities of working as an A&R at Universal Music indicates Kardi still wants to add some more words and chapters to his story. Kardinal Offishall is born Jason Harrow on May 12, 1976 in Scarborough. He lives in the Flemingdon Park area of Toronto as a youth and becomes very interested in his father’s music collection. Harrow’s mother works as a teacher and he occasionally is in a class where she is the teacher. She discovers he has an interest in rapping and she encourages him to write his first rhymes. Newly christened MC J-Ski records a demo at a Mr. Greenjeans restaurant in Toronto’s Eaton Centre. He enters an anti-drug rhyme he had written in a Scadding Court community centre contest and wins. One of the prizes is to meet Maestro Fresh Wes, the pioneering Canadian hip-hop artist fresh off the success of his debut album Symphony in Effect. Maestro tells the young high school student to stay in school. J-Ski is interviewed on CBC’s The Journal by Barbara Frum about the anti-drug message in his rhymes. Soon the young MC transforms into Gumby D, and is a regular performer at malls, with two friends, known as Young Black Panthers, winning money from contests. These include Harrow performing for Nelson Mandela on his first foreign trip after being released from a South African prison. Out of Stephen Lewis’ commissioned report, following a 1992 racially motivated protest in Toronto referred to as the Yonge Street rebellion, a youth jobs program called J.O.Y. (Jobs for Ontario Youth) is created. Harrow enrols in the program’s first year in an arts-oriented section of the program called Fresh Elements, where youth are given income assistance to pursue their creative paths. The next year, the program is retitled Fresh Arts, and features many more students. Among those involved in the program are artists who will come to be known as Saukrates, Jully Black and video director Little X (now Director X). While in the Fresh Arts program, Harrow (now rapping as Kool Aid) forms the Figurez of Speech (F.O.S.) hip-hop crew with other program participants. The program provides mentorship and an opportunity to intern at radio stations, among other opportunities, and leads Harrow to seriously consider a recording career. Meanwhile, under his DJ name J-Rock Ultra, Harrow sells mixtapes in school. 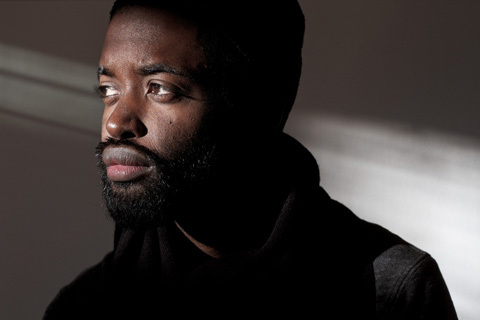 When his Fresh Arts friend Saukrates decides to record his first single, Kool Aid is in the studio and earns a co-production credit on the recording, “Still Caught Up.” The song becomes a key track in Toronto’s mid-’90s hip-hop resurgence, garnering significant play on local university radio and is nominated for Best Rap Recording at the 1996 Junos. By this time, Harrow has changed his rap moniker to Kardinal Offishall after learning about Cardinal Richelieu, the 17th century adviser to Louis XIV. One morning during school, he hears a song and some lyrics in his head. He writes the track, called “Naughty Dread,” and heads to the studio that evening. Featuring a fairly prominent Bob Marley sample of “Natty Dread,” the song is featured on the landmark all-Canadian rap compilation Rap Essentials Vol. 1. Kardinal also releases a twelve-inch for “Naughty Dread” featuring a song called “On Wid Da Show” on the flip side. It’s on Kneedeep Records, run byChoclair‘s producer and manager Day. Soon Choclair’s crew Paranormal and Figurez of Speech converge into one larger crew known as The Circle. The Grid publishes a nice reflection on a critical year for hip-hop in Toronto from one of the city’s premier hip-hop writers, Del F. Cowie. Twenty years ago, two independent singles—by Ghetto Concept and Saukrates, respectively—changed the future course of Toronto hip-hop. The year 1994 saw the release of several landmark American hip-hop albums, and 2014 has been doing a good job of remembering them. In addition to Notorious B.I.G.’s debut, Ready to Die, 1994 yielded such classics as Nas’ Illmatic and Outkast’s Southernplayalisticadillacmuzik,whose 20th anniversaries are currently being celebrated with a remastered re-release and an extensive comeback tour, respectively. With hip-hop firmly established as a global phenomenon by the early ’90s, Toronto aficionados were no less voracious in their consumption of these records than our counterparts south of the border. But the city’s rappers and producers were, in hindsight, also on the cusp of a key, transformative moment for the city’s embryonic yet prodigious hip-hop scene. 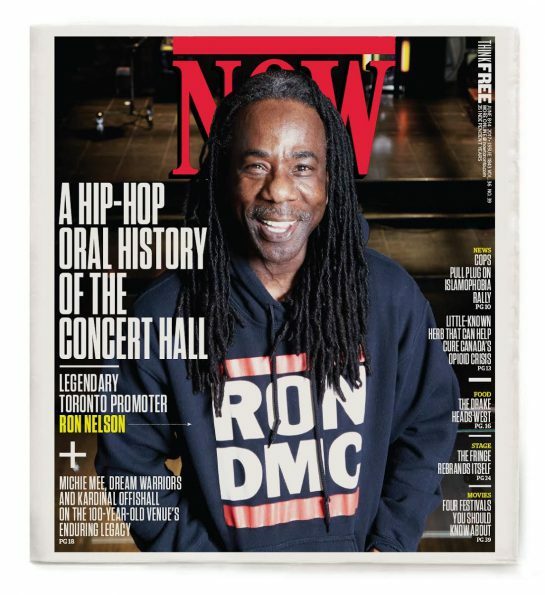 While mixtapes, Soundcloud pages, and YouTube videos define the independent hip-hop grind these days, 1994 saw a surge in the number of local MCs committing their work to vinyl, building on the groundbreaking success of Maestro Fresh Wes, Michie Mee, and Dream Warriors in the late ’80s and early ’90s, and ushering the phrase “T-dot” (coined by pioneering Toronto MC K-4ce) into the local lexicon. But of the countless people contributing to the scene at the time, two entities stand out from the crowd: Ghetto Concept and Saukrates. Jully contributes to The Huffington Post’s “What I’d Change About Canada” editorial series. If Kardi’s “Mr. International” then Jully is definitely “Ms. Media Mogul”. She can rock the stage, the studio, the radio (as artist or personality), TV (as artist or personality, lol) and now print media. Jeez. 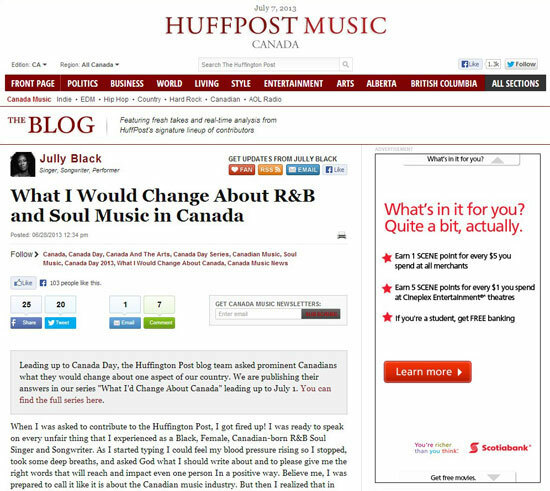 What I Would Change About R&B and Soul Music in Canada. When I was asked to contribute to the Huffington Post, I got fired up! I was ready to speak on every unfair thing that I experienced as a Black, Female, Canadian-born R&B Soul Singer and Songwriter. As I started typing I could feel my blood pressure rising so I stopped, took some deep breaths, and asked God what I should write about and to please give me the right words that will reach and impact even one person In a positive way. Believe me, I was prepared to call it like it is about the Canadian music industry. But then I realized that in spite of it all, I have been so blessed to make music for a living for the past 18 years. Now, are there things I would change or reform about the Canadian music industry? Oh, you best believe it! But in order to affect change permanently, you have to be the change you want to see. So with that in mind, here is what I would change about the Canadian music industry. If I was handed a magic wand, I would erase all of the unsaid fear that a lot of the executives at radio stations, record companies, corporate brands, television and print media outlets have in promoting and celebrating our domestic R&B soul singers. I would urge them to passionately and freely support the artists of this genre in ways that are equal to the artists of other genres. This support will not only allow them to attain enough success to stay in Canada, live great lives, and support themselves full time, but it will provide a way to pay it forward.